We are proud to be among the pioneer 22 private bus companies to be accredited by CaseTrust. Because myBus team members are our most valuable assets. We place Workplace Safety and Health as our priority. We ensured every member under our care returns home to his family safe and unharmed. Our apps was featured on Strait Times dated 21 Oct 2015. We are proud to be the 1st private bus company to launch Live-Track apps for passengers. 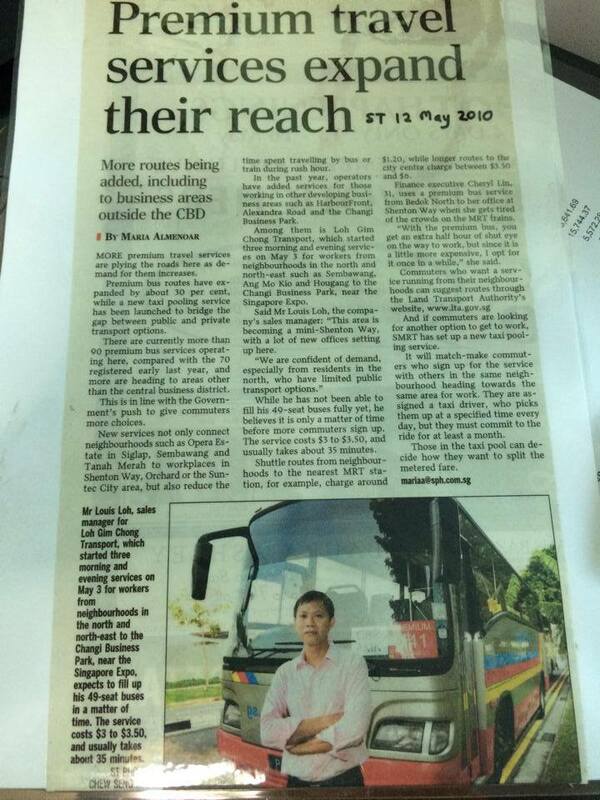 We are confident "myBus SG Live-Track" apps will benefit future customers as well, especially shuttle bus services for shopping malls and condo. City Direct 656 (sembawang): Launched 17 Feb 2014 - City Direct 656 offer a direct route from Sembawang with limited stops to CBD via Expressway and vice versa. Peak Period Short Service 359P: Launched 11 June 2014 - Service 359P overlay Service 359 during weekdays peak period, plying between Pasir Ris interchange and Pasir Ris Dr 1 & St 51 to better serve residents travel needs. Both City Direct 656 and 359P services had been taken back by LTA and run by Public Transport operators, SMRT & Go-Ahead respectively. Implemented "GPS Fleet management system" on all our buses. We were featured on TODAY iDA article, 19 Nov 2011, on how SMEs can leverage on technology to reduce costs and improve efficiency and services. Launched "Premium Bus Services to Changi Business Park"
We are the 1st bus company to provide Premium Bus Services to Changi Business Park. Our direct bus services provide convenient, shorter travelling time and comfortable rides for residents of Sembawang/Yishun, Sengkang, Punggol, Ang Mo Kio, Hougang ave 9 to and fro work. myBus.com.sg © Copyright 2016. All rights reserved. Web Design By Interactive@OOm and SEO by OOm.